Recently we interviewed Olga Odeide, Vice President of Industry Partnerships with the American Society of Interior Designers (ASID), to learn about her role with the organization and its’ focus on helping designers. SRFD: Tell us about your background. Olga: I’ve had an interesting, non-traditional career arc. I started out in design of a different sort – electrical engineering, circuits and high tech system design. I eventually led a diverse global sales team, but was drawn to more creative pursuits. I pivoted into Interiors and studied at The Art Institutes (where I originally connected with ASID as a student member). After some time at a leading firm working multi-million dollar installations, I combined my design knowledge with my background in business development into a consulting position, working with Design and Architecture firms nationwide to refine growth strategies, streamline operations and maximize profitability. It was during this time that I also enhanced my ASID experience with a Chapter Board role. I’m now at ASID National Headquarters as Vice President of Industry Partnerships, where I work with manufacturers and service providers at a national level to connect them into all that ASID does on behalf of the industry. SRFD: Why should designers be an ASID member? Olga: ASID is a community of designers, industry representatives, educators and students who believe that design impacts lives. When you become an ASID member, you are immediately connected to a distinguished network of peers, thought leaders and luminaries. Members have access to the Society’s leading-edge industry research, it’s bi-monthly international magazine, i+D, and a vast array of in-person and online professional development opportunities. ASID offers members a robust chapter experience and the chance to lead at the volunteer, local and national levels. And the Society provides members with a collection of business solutions – contracts, business insurance, health insurance, the ASID job bank, exclusive discounts and more – to help them develop successful careers in the design industry. ASID membership is an invaluable tool in propelling designers to the top of their game. SRFD: What have you learned from being on the ASID team? Olga: First and foremost, I’ve learned that the team at ASID headquarters is a committed, high-performing group of talented individuals. I look forward to working with my colleagues every day. I’ve had the opportunity to meet and engage with individual members, Industry Partner members, and leadership at both the local and national level. I’ve formed a new appreciation for the dedication of the designers and representatives I’ve met, and for the vastness of design. There are so many established and emerging areas of specialization – biophilic design, universal design, aging-in-place considerations, workplace and healthcare design – that substantiate the ASID belief that Design Impacts Lives. Olga: I’ve had so many great experiences during my tenure with ASID. But if I had to choose just one, I would have to pick The Leadership Experience: Presented by ASID (EXP) which took place in July 2017 in San Diego. EXP was the Society’s most inclusive event ever and featured content for everyone, from emerging professionals to seasoned designers. Interactive workshops, tours, networking events and more were centered around three topic areas – Lead Yourself, Lead Your Team, and Lead Your Firm. ASID is committed to encouraging and training our members to become leaders in the design industry, and that commitment is the driving force behind EXP. Speakers, including Nancy Giordano, founder and CEO of Play Big, Inc.; Andrew Dent, Ph.D. of Material ConneXion; and several design industry luminaries; offered attendees a fresh perspective on the world of business, leading in the 21st century, and how to lead with authenticity. It was a career-changing experience for all who attended. 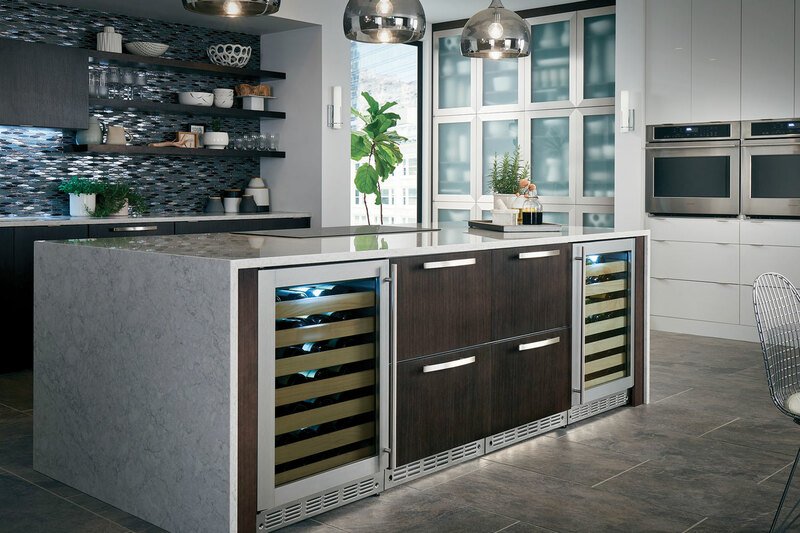 SRFD: Tell us a little bit about your partnership with Monogram Appliances. Olga: It’s been great! Monogram is a National Industry Partner with ASID, supporting the mission to showcase the Impact of Design. National Industry Partner membership provides Monogram access to the broad ASID Chapter network to get brand visibility, participate in various activities, and build relationships with designers at the local level. In addition, we work closely with Monogram designer engagement leader Alex Skobel to better understand Monogram’s overall goals and objectives to augment efforts with sponsorship at the national level. We’ve had great success with both exposure and engagement with designers, and look forward to continuing to grow our partnership for many years to come. Recently a few team members from A Finer Touch Construction visited the Chicago Monogram Design Center (MDC) to learn about Monogram, the design process, our appliances – and even cook with them! Read about their visit and learn more about the cooktop showdown between electric and gas on their blog.